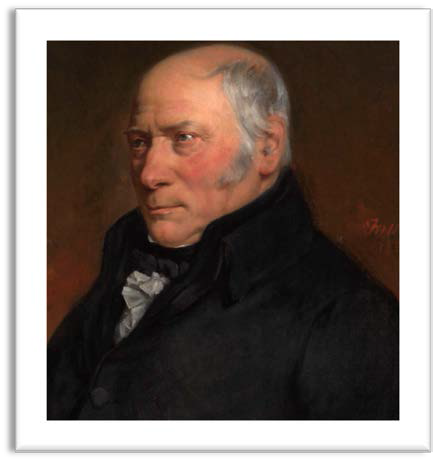 William Smith (1769–1839), surveyor and geologist, was born on 23th March 1769 at The Forge, Churchill, Oxfordshire, the son of John Smith (1735–1777), the village blacksmith, and his wife, Ann (1745–1807). He was educated at the village school, which he attended until about 1780. In later life he was to write “If I could have felt the same confidence in writing that I have in Draining and Floating, this Essay might have made its appearance sooner; but I find less difficulty in directing the labours of the spade, than those of the pen” and later “and there can be no doubt but it would be much better for society, and much more conducive to improvements in agriculture, if farmers’ sons were well instructed in practical geometry and the use of mathematical instruments, with the principles of machines intimately connected with their profession, instead of spending their time in learning Latin, or pursuing other studies, for the attainment of which, not one in a hundred has any occasion.- This mis-application of time in early youth, is of much more consequence to society, than one half of the world is either aware of or inclined to believe”. 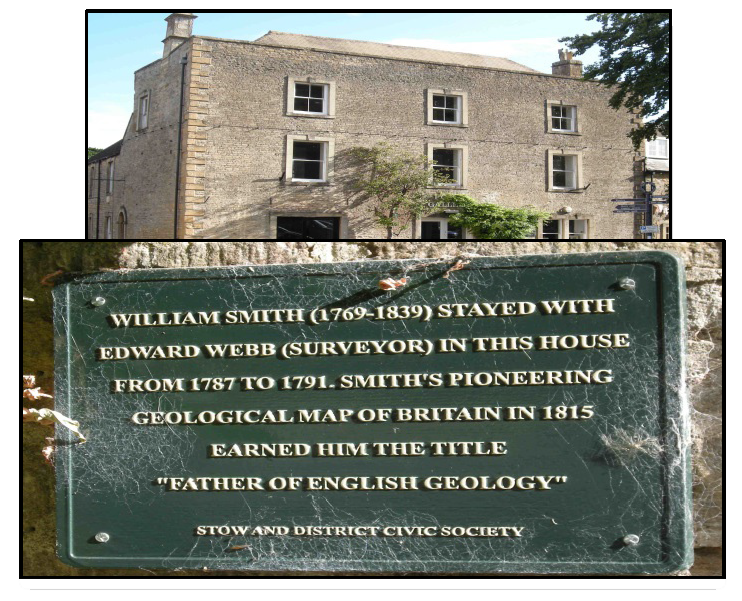 In 1787 Smith became assistant to the land surveyor Edward Webb (1751–1828) at Stow on the Wold, learning to measure and value land. Webb, according to Smith, was “possessed of great ingenuity and skill in mechanics, mensuration, logarithms, algebra and fluxions”, at a time when such surveying included many skills now conceded to the engineer. Shown here are some of the instruments which would have been familiar to Smith. They include measuring chains, surveying compass and a pantograph. In his journal entry for Friday 18th December 1789 (courtesy of OUMNH), the twenty year old Smith records time spent “Repairing and Setting the pentograph [pantograph]” before he “began to reduce the Plan of a Mr C. Norton’s allotments”. It was this early training in surveying that was to prove of great use to Smith in later life. 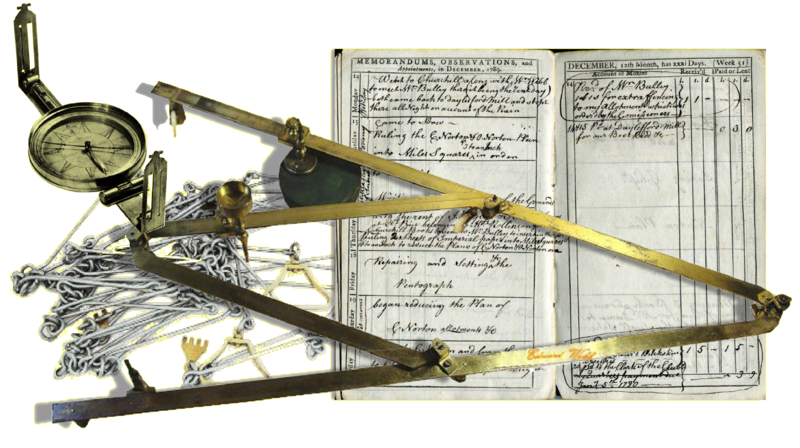 It is very likely that Smith used his expertise with the pantograph in the production of his 1815 map. Late in 1791 Webb sent Smith to survey estates belonging to Lady Elizabeth Jones (1741–1800) at Stowey in north Somerset. After walking there from Stow, he lodged at Rugbourne Farm, High Littleton, which he later named as the birthplace of his ideas. Smith’s work impressed local landowners. 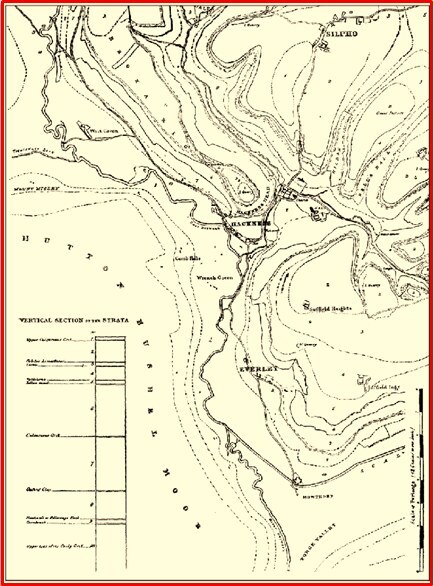 As a result he was asked to survey routes for a planned, double-branched, Somerset coal canal, which was intended to take land-locked coal to the sea and, via other canals, to London (in March 1794 he was in London, giving evidence in support of their enabling act of parliament). Technically innovative, in August 1794 the canal proprietors sent Smith and two local coal owners, the surgeon Richard Perkins (1753–1821) and Samborn Palmer (1758–1814), on a fact-finding tour of canal and colliery installations throughout the Midlands and north of England. On this trip Smith was able to continue his embryonic geological investigations. Canal excavations started in July 1795. These extended west to east along two sub-parallel and deeply incised valleys, about two miles apart. The excavations revealed the gently dipping strata one by one, allowing Smith to compare those of one branch of the canal with those of the other. By the end of 1795 Smith had worked out the local (incomplete) order of strata. On 5th January 1796 he recorded his critical observation that some of the strata contained fossils, and those that did could be identified by them. This realization allowed Smith to separate, for the first time, strata which had previously been confused because of a shared lithology. This was a major geological breakthrough. Furthermore, Smith’s training as a surveyor led him to realize that he could colour such strata onto maps, since he understood their thickness and dip and thus their geometry. From 1799 he started both to map local strata and to show them on geological cross-sections. The canal excavations may have provided Smith with valuable geological data, but by 1799 there were more practical and immediate construction problems to be considered. During their fact-finding tour of 1794 Smith, Perkins, and Palmer had seen the half-size caisson erected in Shropshire by its inventor Robert Weldon (1768–1804). 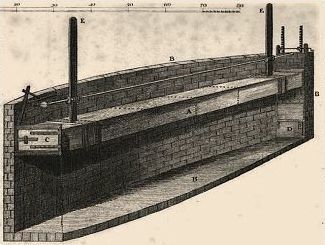 The use of such caissons was adopted by the Canal Company; it was intended that each caisson would replace several canal locks and save much- needed water. However, the caissons needed to be constructed to an extremely high standard to remain watertight. The first and only one was built at Combe Hay. The caisson was a watertight box (A) into which the boat entered at the upper level (C), was submerged and finally left the caisson at the lower level (D). The whole system proved to be inherently dangerous and unstable. During one trial the whole of the SCC Committee became entombed in the submerged caisson and nearly suffocated. Shortly afterwards the caisson failed. It is possible that Smith may have been made the scapegoat for the caisson fiasco for, in June 1799, Smith was dismissed from the Canal Company’s employment (for which he was then being paid £450 a year). Alternatively, the SCC Directors may have viewed his purchase of the Tucking Mill estate, which lay adjacent to the canal, as a conflict of interest. After his dismissal by the Canal Company, Smith set up, in partnership with Jeremiah Cruse (1758–1819), as a land surveyor in Trim Bridge, Bath. Bath proved a fortunate location for the business, since so many of the landed gentry holidayed there. Between 1802 and 1805, his Bath shop was also the venue at which his fossil collections were publicly displayed. During this period Smith dictated a list, the ‘Order of the Strata round Bath’, to his two local supporters, the Revd Joseph Townsend (1739–1816) and the Revd Benjamin Richardson (1758–1832). 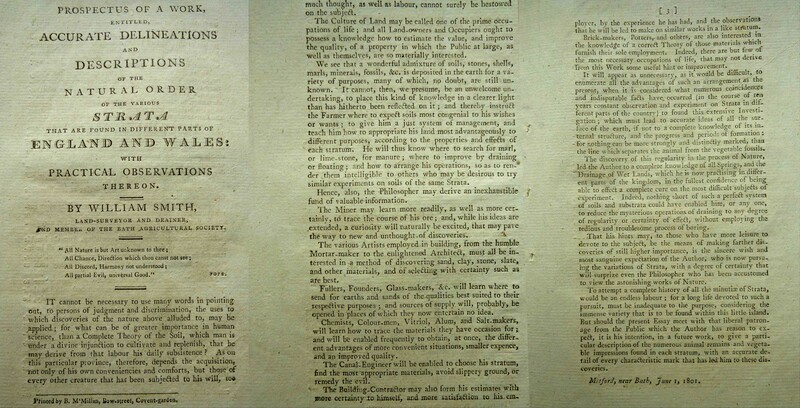 With their encouragement he issued a prospectus in June 1801 for his intended book, Accurate delineations and descriptions of the natural order of the various strata that are found in different parts of England and Wales, to be published by John Debrett (d. 1822). Smith knew that his stratigraphic ideas had great economic potential as the text of the prospectus (see below) clearly shows. He also recognizes that “the complete history of all the minutiae of Strata would be an endless labour”, nevertheless Smith states that if the book is well received he intends to continue the task. 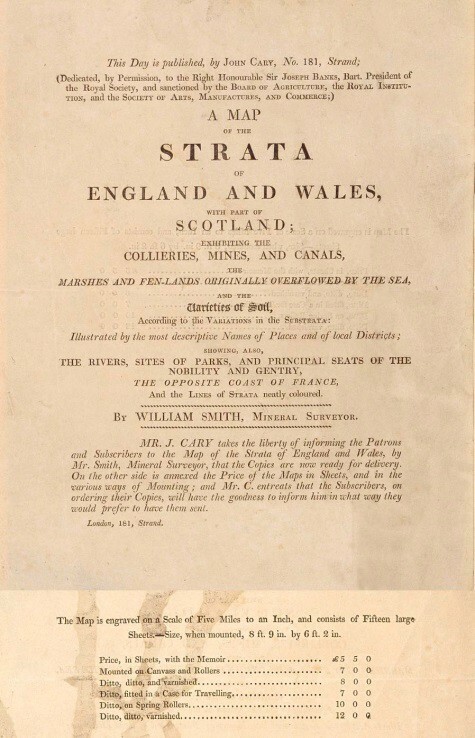 This work was not to be published as a complete work, but it is clear that Smith already had a grand idea of how the strata should be shown on geological maps, cross sections and in a descriptive table of strata. The idea may have been clear, but in addition to more detailed mapping on the ground, huge resources would be needed to bring it to pass, resources not available to a 30-something jobbing surveyor, recently sacked. Nevertheless, within twenty years, Smith was to achieve this goal. His maps and cross sections would be published, as would his Strata identified by Organized Fossils, all without the resources that were soon to become available to The Geological Society of London, but which would never be available to Smith. Smith had first undertaken land drainage work for the Canal Company chairman James Stephens (c.1748–1816). By late 1799 he was much in demand as land drainer around Bath, a demand augmented by the extraordinarily wet autumn of that year. In 1800, in Wiltshire, he drained the Tytherton estates of Thomas Crook, in the process discovering another new stratum (the Kellaways Rock) to add to his order. Smith’s work here was inspected by the landowner Thomas William Coke (1752–1842) who subsequently invited Smith to Holkham, Norfolk. In summer 1801, Coke introduced Smith to Francis, Duke of Bedford (1765–1802), then trying to drain some of his Woburn estates with the assistance of his land steward John Farey (1766–1826). Smith and Farey met in October 1801 and Smith’s results greatly impressed Farey with their novelty and economic importance. As a result, in February 1802, Farey brought them to the attention of the landowning president of the Royal Society, Sir Joseph Banks (1743–1820). John Phillips, writing in Smith’s Memoirs (see below), recalls Smith’s work on the draining of the Minsmere marshes in 1814. The work was successful but in 1940 the drained land was deliberately flooded in order to act as a barrier in the event of enemy invasion. The Minsmere marshes are now an important RSPB Nature reserve and habitat for the endangered hen harrier. Great Britain in the late 18th and early 19th century was undergoing great change. The industrial revolution was in full flood and there was an insatiable desire for coal to turn the wheels of industry. Traditional mining areas were in the north of England, Scotland and south Wales. To the south and east, coal was less abundant. However, coal fields were known in the Bristol area since Roman times and their occurrence was to spawn many coal trials in the region. Smith was quick to realize that most of these trials were not scientifically based; costly experiments to find coal were being made far too high in the succession. Smith knew that the Coal Measures generally unconformably underlie Triassic Red Ground in the area. In 1804 he became involved in a coal trial at Batheaston. He correctly predicted that Red Ground would occur below the Lias and assumed that productive Coal Measure should occur below this. Shafts were sunk at Batheaston but unluckily did not find coal. Instead they found sandstone (now known as Chromhall Sandstone, part of the Carboniferous Limestone sequence) which was below the Coal Measures. 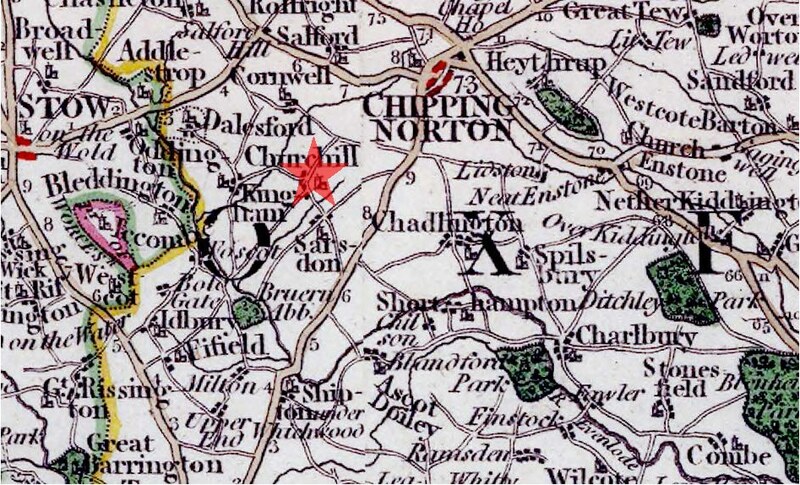 In 1805 Smith visited the site of another intended colliery at Cooks Farm at South Brewham. Here he quickly realized that the shaft was being sunk in the Clunch Clay (Oxford Clay) far too high to find coal. His advice to cease work, however, went unheeded and investors lost a considerable amount of money. 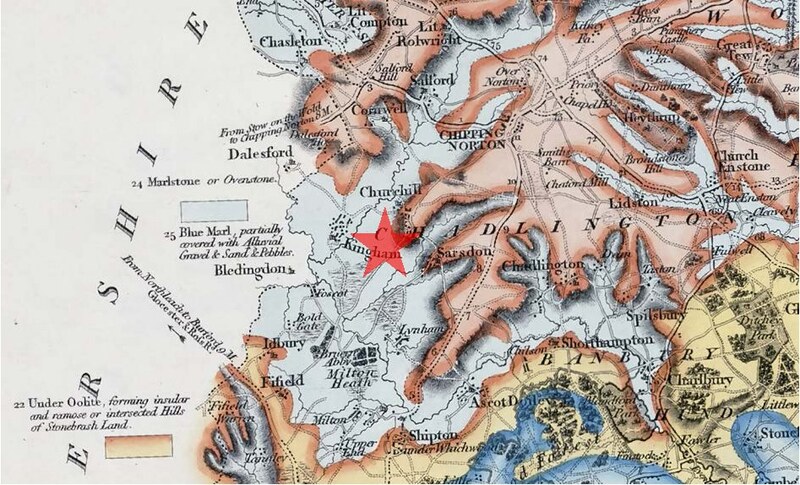 It seems likely that Smith may have been inspired to make his first geological map after seeing a coloured soil map around Bath published by Billingsley and Davis in the 1798 edition of the Somerset County Agricultural Report. Using a copy of Taylor and Meyler’s Map of Five Miles around the City of Bath, Smith coloured the geological distribution of the Oolite, Lias and Triassic “Red Ground”. The copy shown below is that which Smith presented to the Geological Society in 1831 on the occasion of his award of the Wollaston Medal. 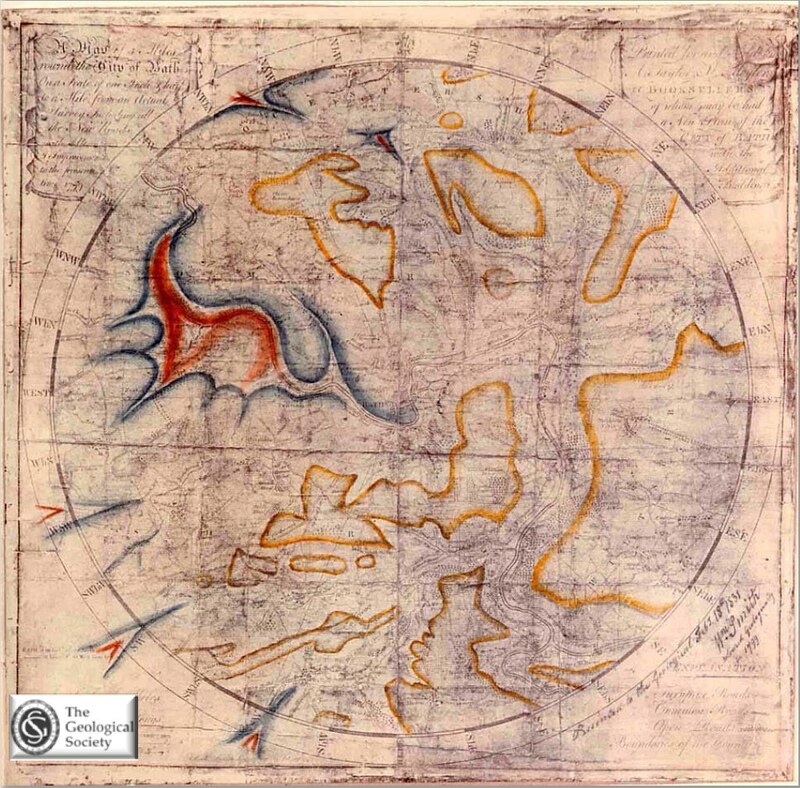 He records the original date as 1799 and notes that the map was “geologically coloured”. There can be little doubt that this odd circular map was the first true geological map ever produced. 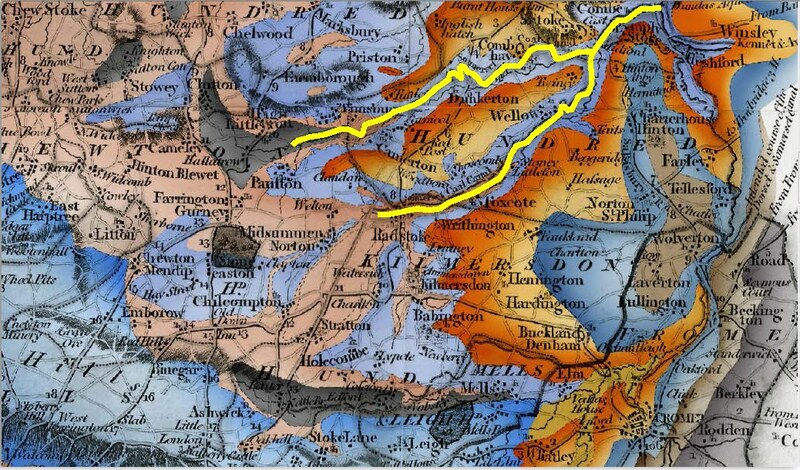 One year later in 1801 Smith made his first attempt at a geological map of England and Wales (shown right). The trouble to which Smith went when mapping geology, sometimes travelling up to an amazing 10,000 miles a year, is well known. 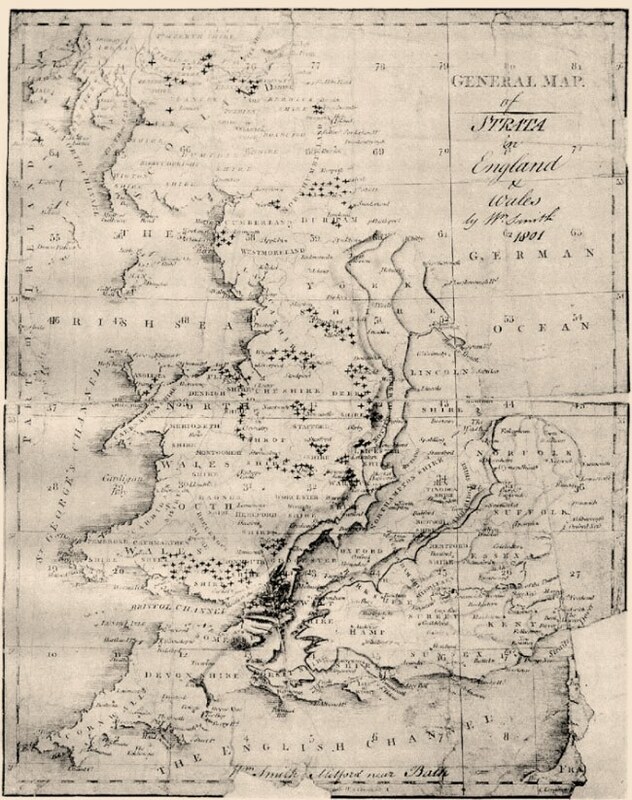 His otherwise largely unsupported private map project had had to be undertaken while he was working on commission, between 1799 and 1815, for an astonishing array of land and mine owners across England and Wales. Smith’s finances were always precarious and 1815 proved a particularly critical year for Smith. William Baugh (c.1770–1815), a Shropshire-born engineer and contractor for the London docks and Ramsgate harbour, had been providing vital financial backing for Smith’s countrywide project. Smith’s diary records how on “11th January 1809 [he had] met Mr Bough and settled mortgage [on his later disastrous Tucking Mill property, near Bath]”. 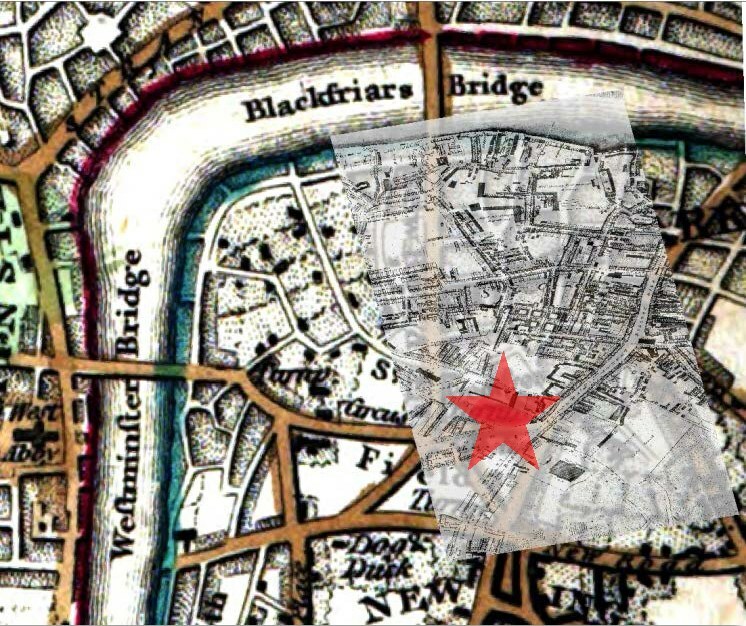 However, in 1814, Smith was twice arrested in London for debt. Smith and Baugh then held frequent meetings until 13th February 1815, but, on 27th May 1815, Baugh died unexpectedly, aged 45. His sudden death forced Smith, once again, to confront his ever-deepening financial crisis. Smith had borrowed money from Charles Conolly (c.1761-1828) and when Conolly pressed for repayment Smith was forced to sell his fossil collection to an uninterested British Museum and also his library had to be sold. This was all to no avail and in June 1819 he was consigned for debt to a ten week stay in the Kings Bench Prison in London. In spite of these difficulties, Smith continued work on his map, which was first published in August 1815, with its novel use of colours, tied as far as possible to the colours of the rocks themselves. This colour scheme was used not only on the map, but also in the papers chosen to represent the separated strata in his accompanying, but never completed, book Strata Identified (1816–1819). This book is again of great rarity, like all Smith’s geological publications. His additional attempt to demonstrate a three-dimensional, subterraneous geometry, via enhanced colouring of the bases of each major stratigraphical unit, was extremely effective but also costly. On top of this, Smith was continually modifying his map, as the Eyles demonstrated in 1938, when they showed that there were at least five different series of Smith’s map. 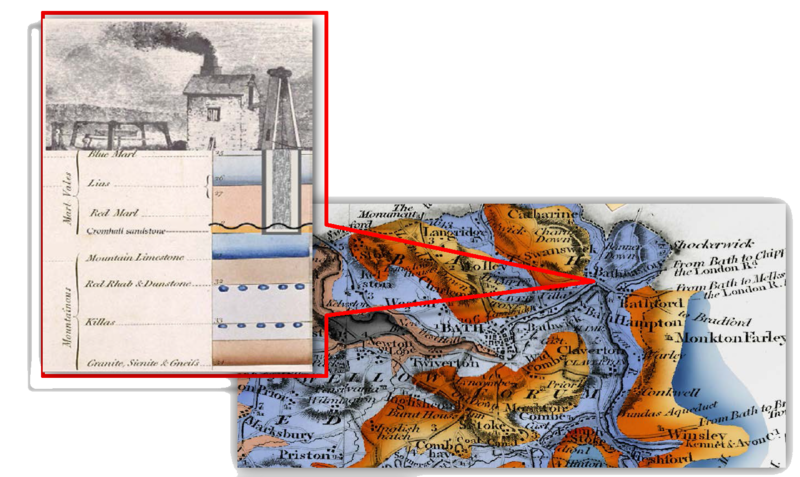 These maps, we now know, were produced between 1815 and 1836 or beyond; 1836 is the date of the restored copy (Z) now on display at The Geological Society. The fact that some of Smith’s maps are on paper watermarked as late as 1836 shows that they continued to be sold well after the rival G.B. Greenough map had been published in May 1820 by The Geological Society (or the “Anti-Smithian Association”, as John Farey now called it).There is no doubt that this rival Society map was much aided by the existence of Smith’s earlier map, but, in the extraordinarily socially stratified world of the time, all we learn of Smith’s map from the Greenough camp is from an early 1817 report: “Greenough is as enthusiastic as ever in his favourite pursuit. His map is not yet published, nor does it appear likely to be. In the meantime, inferior works, [i.e. Smith’s] are daily depriving him of that merit of originality to which his Map is entitled”. 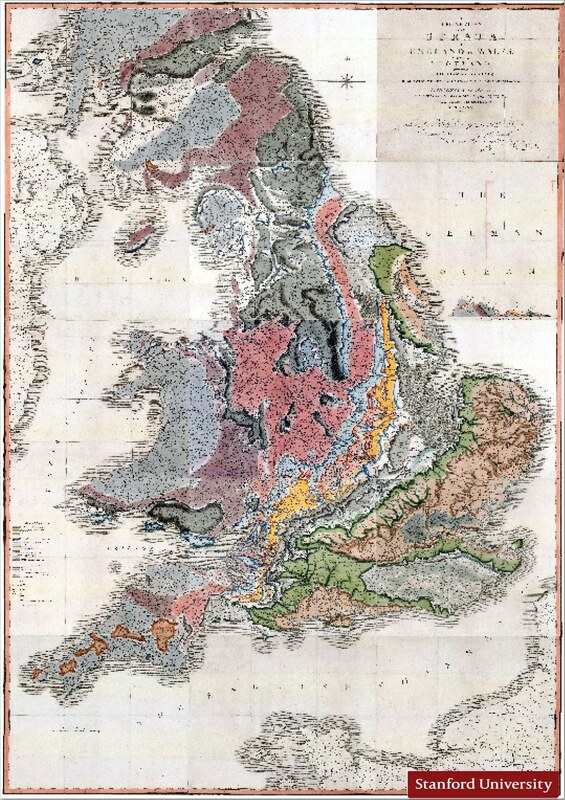 In his Memoir of a geological map of England (1820), George Bellas Greenough, first President of the Geological Society, claims to have begun a geological map of England in 1808, shortly after the foundation of the Society. Unlike Smith’s maps, which were the work of an individual, Greenough’s map was a compilation of observations and local maps sent to him by geologists and other naturalists around the country. Like Smith’s map, it was based on a new topographical base map, drawn for Greenough by Thomas Webster. Apparently, the need for a new base map delayed its publication until 1820, (although the map is dated 1819), but according to Greenough it was with the engraver from 1814. 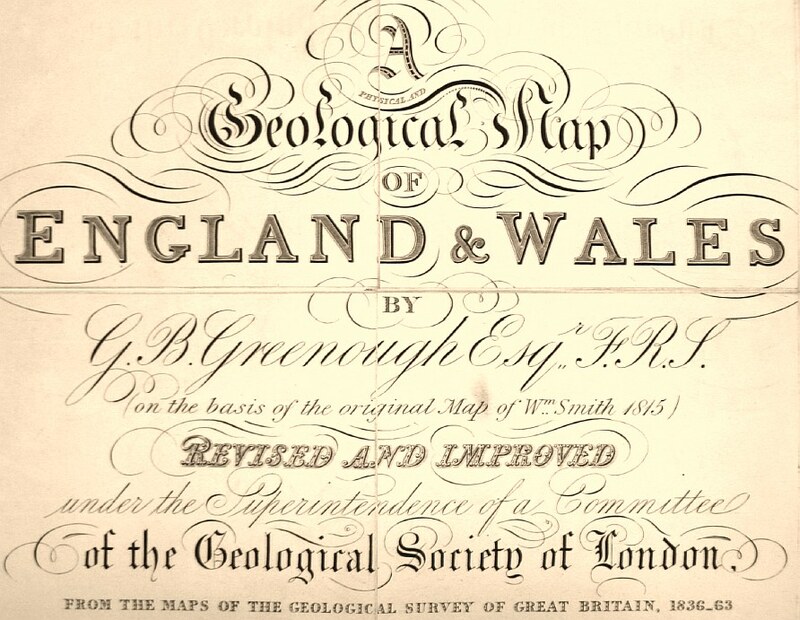 Title page of Greenough’s 1865 Geological Map of England and Wales. 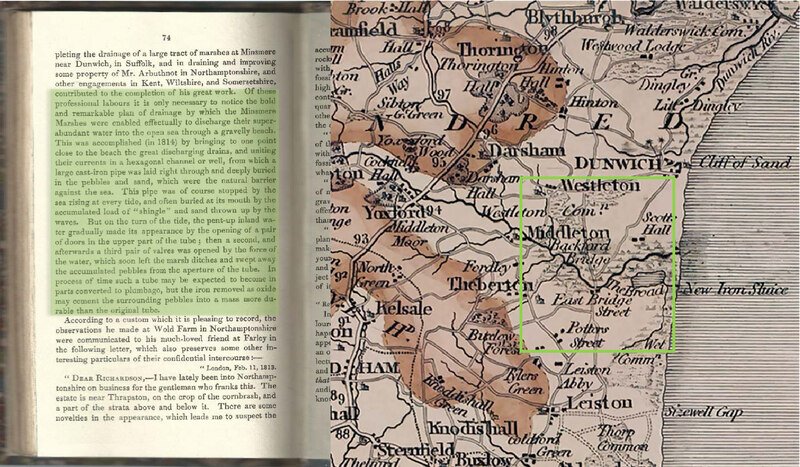 Under Greenough’s name is written in parenthesis on the basis of the original Map of Wm Smith 1815. 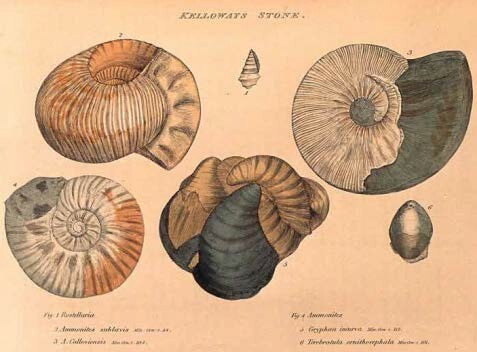 By this time Greenough’s original work had evolved considerably and incorporated the work of Murchison and Sedgwick on the Palaeozoic of Wales and Henry De la Beche’s work in Devon and Cornwall. On his release from prison in 1819, Smith turned his back on London and went into exile in the North of England, helped and accompanied by John Phillips, who was now learning from his uncle the trade of first apprenticed geologist in England. 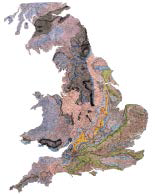 It was at this time that John Cary started to publish William Smith’s Geological maps of English Counties. Twenty-one counties were completed but Smith never finished the series (although many partially completed maps exist in manuscript form). Also at this time, Cary published a series of geological sections made by Smith. From 1820, Smith and Phillips were itinerant across the whole of the North of England and in 1824 and 1825 they lectured widely in Yorkshire. In 1828 Smith was offered the position of land steward to Sir John Johnstone (1799–1869) at Hackness, Yorkshire. There Smith produced his last, and probably most underrated, masterpiece, a detailed and wonderfully accurate geological map of the Hackness estate at 6½ inches to the mile (published in 1832). 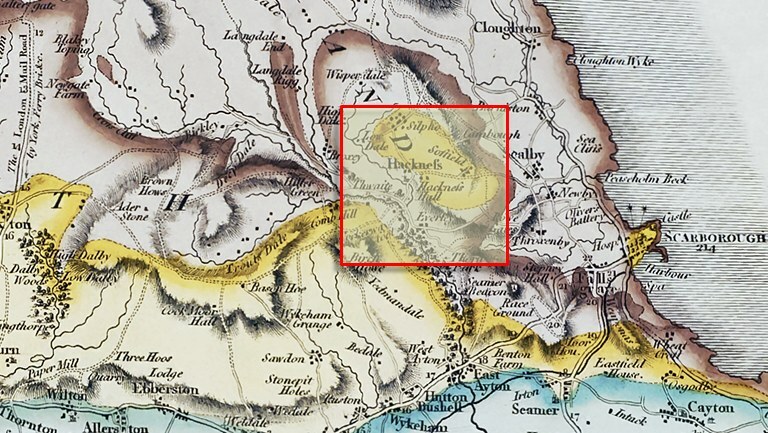 An uncoloured version of the map is shown here, together with its location on Smith’s Geological map of Yorkshire. Sir John Johnstone was President of the Scarborough Philosophical Society and in 1829 was instrumental in raising funds for the building of the Rotunda Museum. The museum was built to Smith’s design using Hackness stone. The museum housed a collection of fossils and rocks arranged in stratigraphic order and John Phillips prepared a coastal geological section of Yorkshire drawn inside the dome of the building. While at Hackness, Smith took on several pupils including John Roby Leifchild (1815-1899) who later became a coal commissioner and was famous for his devastating review of Charles Darwin’s Origin of Species (Darwin never discovered his true identity). In 1831, the new generation of Fellows of the Geological Society, long aware of the treatment meted out to Smith, awarded him their first Wollaston medal in “recognition of his being a great and original discoverer in English Geology” (Proceedings of the Geological Society, 1, 1831, 271). This was presented in 1832 at the Oxford meeting of the new British Association for the Advancement of Science (BAAS), at whose meetings Smith became a regular attender. In 1832 he received a government pension of £100 a year. In 1834 he left Hackness to settle finally at Scarborough, Yorkshire. At the 1835 BAAS Dublin meeting Smith was awarded the honorary degree of LLD from Trinity College. At several of these BAAS meetings Smith presented papers, but often they only demonstrated Smith’s great limitations in the new world of theoretical geology, to which he was now expected to contribute. In 1837–8 Smith was a member of the commission which sought stone for the new houses of parliament. Smith died on 28 August 1839 at the house of George Baker, Gold Street, Northampton, on his way to the Birmingham BAAS meeting, and he was buried on 2nd September at St Peter’s Church, where a memorial bust was put up in his memory. The finest tribute of many was paid him by his obituarist in Scarborough. In appearance Smith was strong, muscular, and well-built. He was equally taken to be pugilist, soldier or walker. A trace of a once broad Oxfordshire accent only left people further confused, whether about his unusual activities or his yeoman origins. Smith married the mysterious Mary Ann (c.1791–1844), probably in 1808. She was described in 1824 “as unsuited for being the partner of a meditative philosopher as she could well be” (W. C. Williamson, Good Words, 18, 1877, 62). By 1819 she was mentally unstable and she died in 1844 in the lunatic asylum at York. Phillips, Smith’s nephew and biographer, wrote in January 1831 to Adam Sedgwick that Smith’s achievements had been despite “long and heavy afflictions. Poverty, disappointment & neglect forced seclusion from the world of science—these have been heightened by a still more severe and invincible torment a mad, bad, wife”.